It is probably obvious from my photos that I love le feste Natalizie-the Christmas season. Festive décor, lights, music and baking help me get through the early darkness and awful weather at this time of year. I decorate every room in my house, but my favourite piece of Christmas is definitely the Presepio. A few years ago, I wrote a blog post about the history of Il Presepio and have included photos of mine in previous December posts. My Presepio has grown over the years, but includes mostly the ‘main players’. My Mamma’s Presepio also started out this way, but is now a whole village. It was originally placed under the tree, since l’albero di Natale was a new tradition for most new italocanadesi. It was eventually moved to the fireplace hearth, and then to a table. 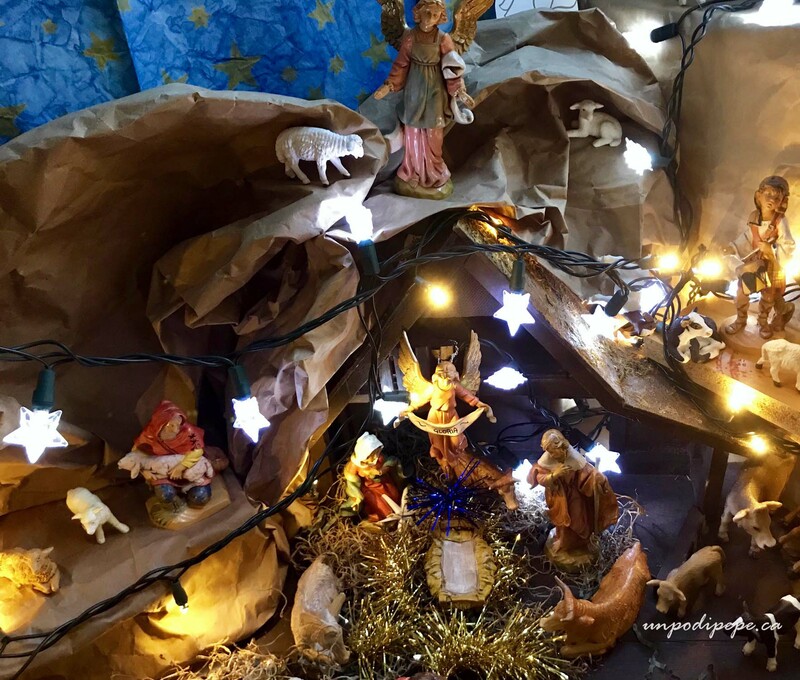 The stable was originally ‘rustic’, made with one of those large paper grocery bags, with the rim folded down many times and a window cut out the back for a light, or a mandarin orange box covered in brown butcher paper. The figures were the Holy Family, an angel, and ox and donkey, a shepherd with a few sheep and the 3 Wise Men. The manger is empty in the photo, as Baby Gesù does not get placed there until tonight, la Vigilia di Natale. The 3 Wise Men or Rè Magi are far off in the hills since they do not arrive in Bethlehem until the l’Epifania, January 6th. Trailing behind is La Befana trying to catch up to them. Presepio figures are not easy to find in Vancouver, but she slowly acquired village people, more shepherds, camels and lots of other animals. Various pieces were purchased in Assisi, the Vatican and Mexico, even a napkin holder from Venezuela doubles as il forno. The beautiful starry sky was brought by a friend from Roma. 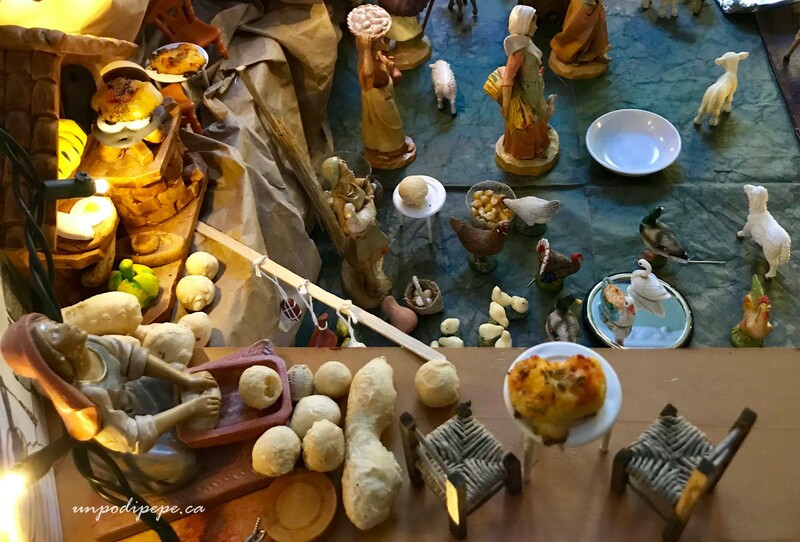 In August I went to Via San Gregorio Armeno in Napoli, the street famous for Presepio making artigiani. 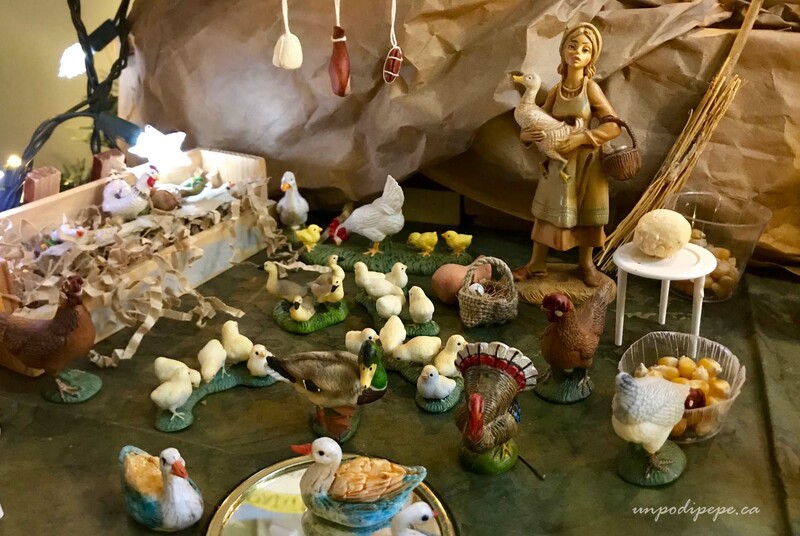 The Presepio inventory is low in summer, but I bought a terra cotta prosciutto, capicollo and cacciotta and a cestino of eggs which you can see in the photo below. I also bought 2 tiny chairs just like the ones we have in Orsara. I forgot to buy a zampognaro-an Abruzzese bagpiping shepherd-so I will have to go back to Napoli! Mamma gets very detailed and creative with her Presepio. She starts working on it mid November and really enjoys putting it together. I am often asked to help create accessories. The cutest detail is the tiny loaves of bread, panini and focaccia Pugliese that she bakes for the forno. 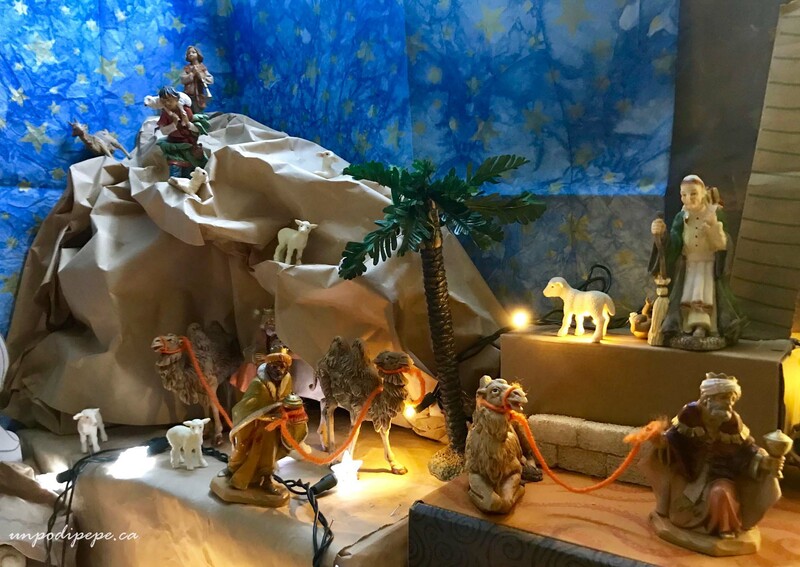 It is interesting to note that San Francesco d’Assisi created the first Presepio in 1223 in an attempt to return to the true meaning of Christmas and take the focus off of gift-giving. So Charlie Brown was not the first to search for ‘the true meaning of Christmas’! If any of you have a Presepio, I would love to hear about it! Cari lettori di Un po’ di pepe, Vi augura un Buonissimo Natale e un meraviglioso 2019 piena di gioia e salute! 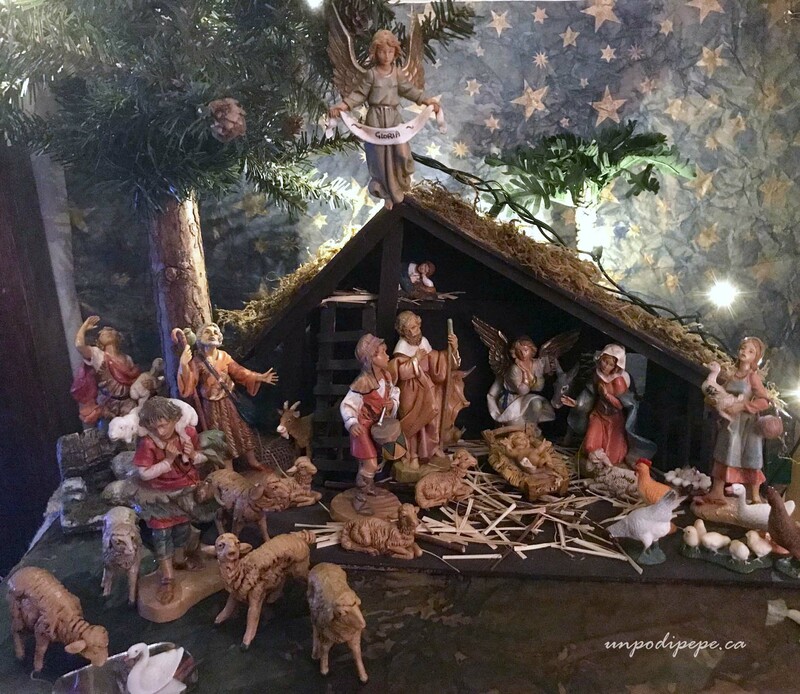 Dear readers of Un po’ di pepe, I wish you a very Merry Christmas and a marvelous 2019 filled with health and joy! That’s beautiful Cristina. 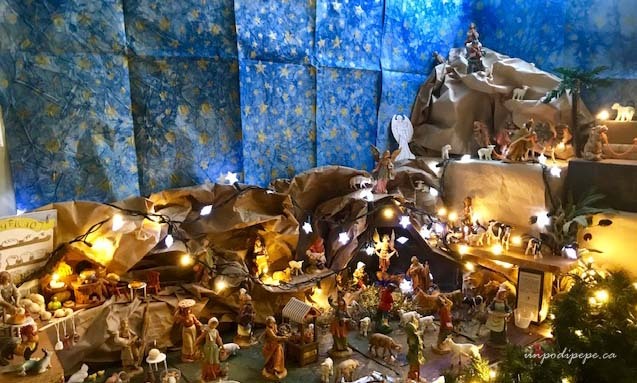 My Italian neighbour used to set up her Il Presepio at Christmas time too, before she moved. My kids used to love admiring her set when we would visit her at Christmas time. I would love to build a collection like this and maybe next time we are in Italy we should check it out. Do you know if you can purchase these from any region or just in Napoli?? Love it! Especially all the real-life touches like the prosciutto and bread. And I can see where you got your creativity. Che bello Cristina, mi piace moltissimo il tuo presepe. Mio padre amava l’albero di Natale, mia madre il presepe. Mio padre era delle Alpi e mia madre Toscana. I am dictating to my cellular. My comment was much longer but I lost everything, my goodness. Buon S.Stefano e felici feste 🎊 a te e a tutti!! Christina, we’ve known each other for a long time, but when i read your blog, it quite often brings me back to that magical place called childhood- and I want to say thank you for that bella! 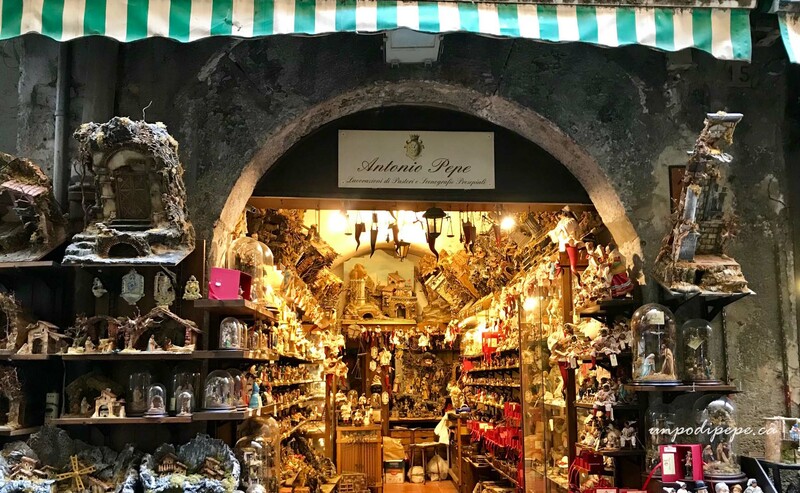 Thanks for reminding me about that wonderful street, Via San Gregorio Armeno a Napoli. I haven’t visited Napoli since 2000 and yearn to go back. I have a few stray presepi, lovely things made in Napoli. I hunt opportunity shops ( thrift shops) for more pieces of the real thing. Tanti auguri cristina.